On 16 May SCIT hosted J.A. Gamache, a world-class professional public speaker. 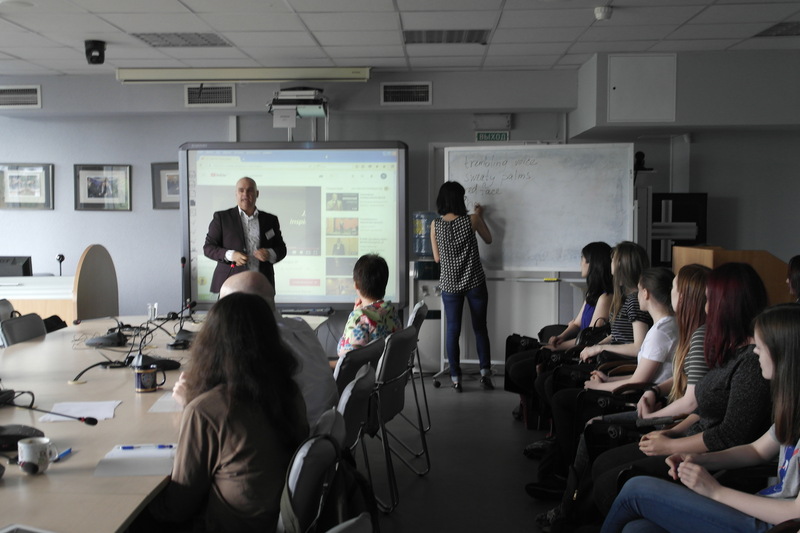 The master-classes were also attended by the students of the Institute of Foreign Languages, Herzen University. Our guest is a member of Toastmasters International – non-profit educational organization dedicated to help its members improve their communication, public speaking, and leadership skills. During three hours J.A. Gamache spoke to the students about how to end the fear of public speaking, gave simple tips on how to deal with various symptoms of this fear and revealed a speechwriting technique to quickly organize thoughts before speaking. The master-classes were held in a free and easy atmosphere; from the first minutes our guest captured the attention of the audience, drew examples from his vast personal experience. His example undoubtedly inspired the students to tackle their fear of public speaking and proved that public speaking can be a lot of fun.